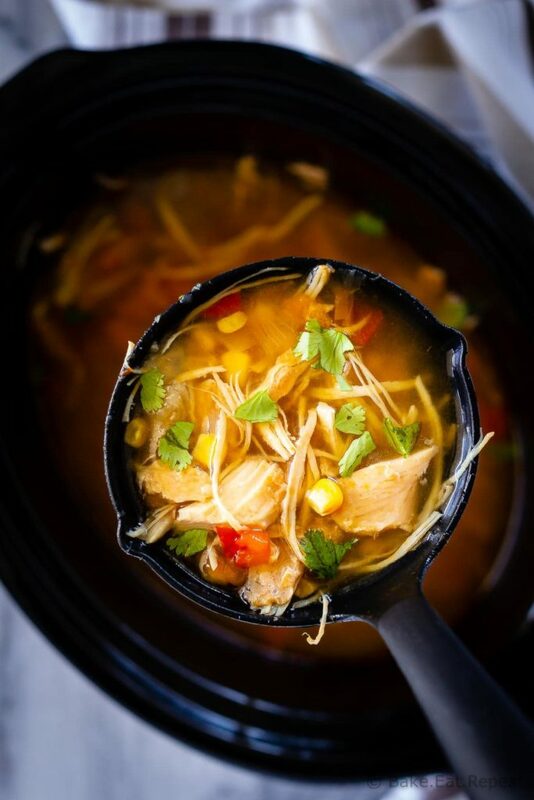 Slow cooker chicken taco soup – the easiest soup to toss in the slow cooker in the morning, and so full of flavour. The whole family will love it! Mmmm, soup. Because by the time February rolls around, it kind of feels like winter is never going to end. Right? And I even got to escape it last week and head to beautiful, sunny, warm Mexico. So I can’t really complain. And it’s not even super cold here. We’ve actually had a pretty mild winter, not insanely cold or snowy. But still. Come mid-February I always start to long for green grass and flowers. And the endless colds and coughs to be over for a few months. Isn’t that the worst part of winter? I don’t even really mind the snow and cold all that much, but the endless stream of sick children does get a little tiresome. There is always someone sick from September until April. Ugh. Why do I live here again? Does that happen in warmer parts of the world too? Or do you lucky people get one cold a year and that’s it? Or do you still have a cold and flu season and it doesn’t even matter where you live? Just curious. Soup is the antidote to cold winter days. 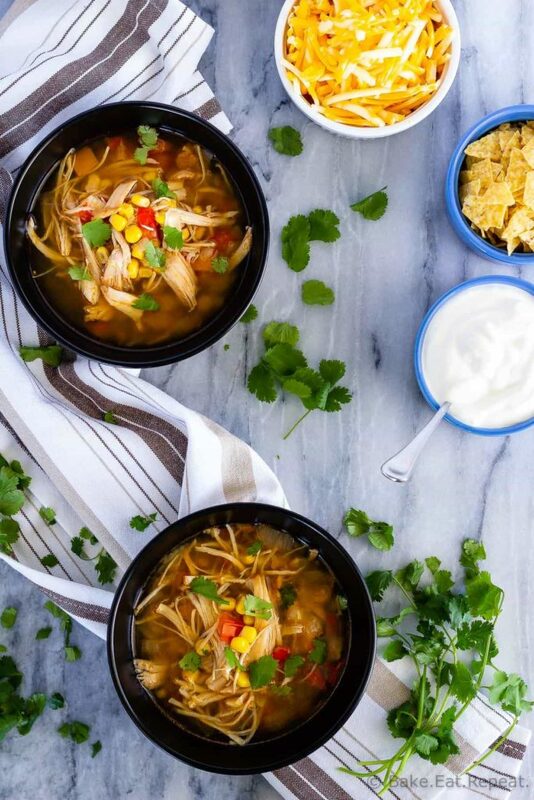 Something about a big bowl of slow cooker chicken taco soup when it’s snowing and cold out – just makes everything better. The last time I made this slow cooker chicken taco soup was actually on a very blizzard-y day. Cold and snowy and just plain nasty out. The exact kind of day that you want to curl up under a big blanket and eat some hot soup. Not that we did that. I have kids, soup and blankets with kids don’t mix. That would be a disaster waiting to happen. We ate at the table. But, I like the thought of curling under a big blanket with a bowl of this soup! Maybe with a fire. Comfort in a bowl, that’s what this is. 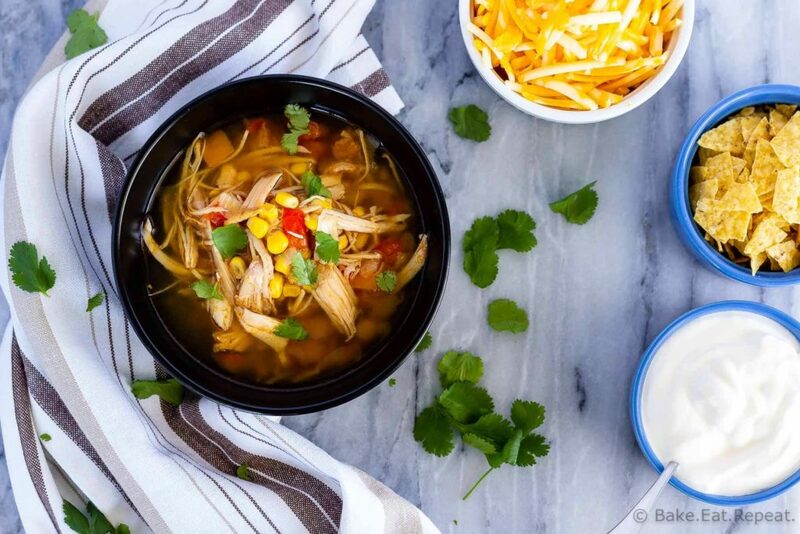 We absolutely love this slow cooker chicken taco soup. So fast, so easy, and so tasty. It takes less than 15 minutes to toss everything into the slow cooker and hit go. And you have the most amazing soup waiting for you when you’re ready for supper. I recommend using thawed chicken breast for this recipe, not frozen, as it is safer to cook thawed meat in the slow cooker. Don’t skip the toppings! Serving this soup with sour cream, grated cheese, cilantro and crumbled tortilla chips just makes it even better. The jalapeno is optional – it doesn’t add any heat to the soup if you remove the seeds and membrane, just flavour – although my kids still prefer this soup without it. This soup freezes well to reheat later – I like to freeze it flat in a doubled ziplock bag as it defrosts easier that way and just reheat it in the slow cooker the day we have it. Slow cooker chicken taco soup - the easiest soup to toss in the slow cooker in the morning, and so full of flavour. The whole family will love it! Place all the soup ingredients in a slow cooker and cover. Cook on high for 4 hours or low for 7-8 hours. Remove the chicken from the slow cooker and shred it with 2 forks. It should shred very easily. Return it to the slow cooker and stir the soup to combine everything. Serve immediately with cilantro, sour cream, cheddar cheese and taco chips on top. Soup can be stored in the refrigerator for 2-3 days, or can be frozen for 2-3 months. Source: Adapted from Baked by Rachel . This recipe looks so simple and good. I'm always on the hunt for tasty, family friendly, work night meals! It's so quick and easy, one of the reasons I love it! Thanks Rachel! Well in Ontario it certainly has been very cold this month. The coldest in 40 years!! I love slow cookers, soups and tacos. This is definitely a win win combination. With a few more days of freezing temperatures, I think I might actually have the time (and weather to match) to make this wonderful sounding/looking soup. Thanks! Hope you like it! Stay warm! Mexico sounds amazing right about now but since that's unlikely to happen, I'll take anything else Mexican in the form of soup! Love this :) I've been making so much soup to keep warm on the East Coast. Thanks Bri! I've been making a ton of soup this winter too. Although I think it's way colder on the East Coast this year than it is in Alberta, which is kind of odd. We're actually having an unusually warm winter! But soup is still perfect, even on those not quite so cold days! Stay warm! Taco soup is my absolute JAM this time of year, and I can't get enough of this goodness! I want a bowl for dinner tonight SO badly after seeing this gorgeous soup! I know, so good in the winter right?! Thanks Sarah! Yum! So jealous about Mexico! Ahh! I could use some sunshine, and I think this slow cooker taco soup can provide that sunshine! Pinned! It seems like families (especially those with small children) get sick a little bit more often. Someone gets sick and it gradually works its way thru the family..at least that's my un-scientific observation anyway. :) I live alone and, luckily, don't seem to catch flu bugs from people around the office. I'm always looking for slow cooker recipes to try (especially this time of year) and this looks delicious. I live in Michigan and the last two winters have been much colder than normal, so I need to keep the warm meals coming for a while! Welcome back from sunny Mexico - hope you had a nice trip! Thanks Jim, we had a lovely trip, although it suddenly feels much colder here! :) Hope you like the soup, let me know if you try it! Thanks so much Mira! Hope you like it! Thanks for pinning! Lucky you to have escaped to a warm place with sunshine! I love that you can make this in the slow cooker....makes it that much more doable! Yup, I was pretty happy to get away for a week - so nice! And slow cooker meals are absolutely the best, so easy! Thanks Kathy! Soup is the BEST! The only thing that makes it better is when you can make it in the slow cooker. PINNED! Exactly! I love slow cooker soup! Thanks Senika! Okay, I seriously need to make more soup. And this one is on the top of my list. I love the chicken taco flavors! Your photos are simply gorgeous, Stacy! Thanks so much Jen! Hope you like it if you try it! Actually I go through phases, making soup incessantly and then not making it again forever. This year I'm loving the soup! Thanks Taylor!